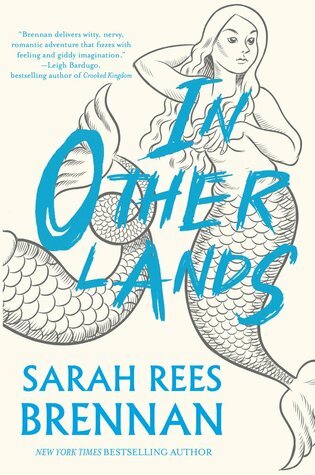 In Other Lands by Sarah Rees Brennan. You will never find me in trouble. You will find me in the library. If you can remember where that is. This immunity toward sarcasm must mean Dale had such a peaceful life. It also meant he and Elliot were basically speaking different languages. There is so much to love about this ingenious, wonderful book: Elves! Harpies! Mermaids! Oh, and totally likeable but still to be kept away to some extent humans, I suppose. Surprisingly no witches or other magical magic. A big adventure of (not) fighting wars with (swords, bow and arrow) pen, paper, words and wit. And during that also managing growing up, falling in love, finding friends, and making other big discoveries (some of which are really spoiler-y and I’m almost bursting with glee just thinking about them). One of the best things is the clever and humorous not really subtle but still not in your face running commentary on society and gender expectations. I’m so obscenely in love with the narrative style, it’s almost absurd. I had so many snort-giggle-laugh moments even if it really shouldn’t be funny but it is just because of that. Don’t get me wrong there are also really heart-wrenching and anxious sad parts ... wouldn’t be Sarah Rees Brennan without them. Maybe you’ve read this story when it was free on the internet, but don’t be fooled this version is everything you didn’t think this story also needed and then some. Plus: if you get a physical copy you can hug it while sighing contentedly. It’s so pretty! And I totally plan on getting it signed ... no idea how I’ll manage that, as Germany is sort of off track in terms of English language author tours. But I will ... there, I said it and so I shall. In the meantime, I hope for many more books where this one came from. And I’ll keep pushing this book into the hands of anyone who knows and tolerates me. Do you have authors that make you pause whatever else you’re reading and get their new releases? Share your loves and teasers in the comments. Sold! I love Sarah Rees Brennan too and this book is going on my "buy" list. Come see my teasers here. Happy reading!